Simplicity is a brand trusted by thousands. Stop by today and see why so many choose this brand. Here at Farm and Home, we understand that having the correct equipment for the job has a positive impact. That is why our Outdoor Power department is strong in quantity and quality, for all your landscaping endeavors. 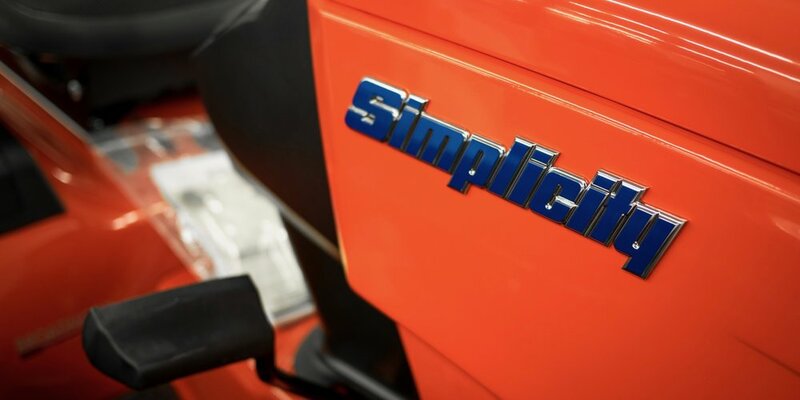 Simplicity offers impressive features raising the bar for mowing standards. Comfort is no longer an afterthought, and lawn striping is made easy with state of the art technology. •Less time on the lawn, means more time for you. •Durable construction and attention to detail help make Simplicity the trusted brand that it is. •Suspension systems keep the ride smooth, allowing for increased responsiveness and more operator comfort (select models). •Commercial inspired components and features such as fabricated decks, powerful engines, transaxles and drive systems for years of performance and durability. •For those in need of a versatile tool, Simplicity's Tractor Mowers provide the simple solution. •These lawn tractors are built to last with durable components - all-steel hoods and seat pans, long-life engines, transmissions and serviceable arbor and shaft assemblies. The exclusive rear suspension feature (select models) provides 25% less impact felt than a standard tractor without suspension, allowing you to have enhanced comfort while achieving a premium cut. (Note: results of suspension depend on grass/yard conditions).